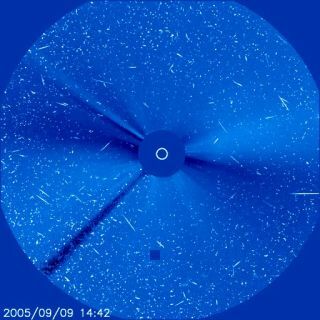 A radiation storm is recorded by the SOHO spacecraft Friday, Sept. 9. The camera has a device that blocks out the Sun itself. An ongoing series of seven major solar flares, including two on Saturday, could disrupt communications on Earth and generate colorful sky shows for people at high northern latitudes for the next several days. Already satellites have been affected. Even more serious effects are possible this week. The spate of activity from the Sun is being generated by a large sunspot named 798. Sunspots are cooler and darker regions of pent-up magnetic activity. When they unleash their energy, it's a bit like the top coming off a shaken champagne bottle. The sunspot is just rotating into view, so its energy has been directed sideways and not directly at Earth. In coming days, if more major flares erupt as forecasters expect, they'll head right at us and radio blackouts, cell phone dropouts and other communications disruptions are more likely, scientists said. Solar flares send radiation to Earth in about 8 minutes. Hours later, clouds of charged particles can engulf the planet. If the magnetic field of a storm is oriented opposite to our planet's protective magnetic field, gaps are created and radiation leaks to the planet's surface, potentially threatening astronauts aboard the International Space Station, sometimes shorting out satellites, and even causing terrestrial power grids to trip. Solar activity is at "very high levels," according to NOAA's Space Environment Center (SEC). electric power systems due to the severe levels of geomagnetic activity. Spacecraft operations, high-frequency communications, and navigation systems such as the Global Positioning System (GPS) constellation of satellites "are also experiencing impacts due to the strong to severe solar activity." A severe geomagnetic storm produced aurora sightings along the northern tier of the United States, and even as far south as Arizona. Aurora are colorful sky lights triggered when charged particles excite molecules in the atmosphere. According to one eyewitness from British Columbia, Canada, the solar storm is lighting up the sky. "It is 10 p.m. and the northern sky here is aglow, as if there were a major league night game at the nearby school," local resident of Cortes Island, John Sprungman, told SPACE.com. He reported no special effects at this moment other than the bright night sky. There have been seven major flares in recent days, including a tremendous X-17 eruption Wednesday. An event Friday evening was an X-6. On Saturday, an X-1 and an X-2 erupted. Even an X-1 can cause severe disruptions. The largest flare in modern times was recorded in November 2003 and was estimated to be an X-40. It, too, was on the limb of the Sun and so its full impact was not felt on Earth. That flare was part of an unprecedented series of 10 major flares within two weeks; at least one Earth-orbiting satellite was disabled and one instrument aboard a Mars-orbiting craft was knocked offline. This week's series is the most impressive since then. Each storm is different, and often solar activity goes unnoticed on Earth, depending on whether a storm hits us square or makes a glancing blow and what the magnetic orientation is. If enough storms erupt, the odds go up that there will be effects here. And the likelihood of Earth taking one directly on the chin goes up with each passing day as the sunspot takes aim. There is a 75 percent chance of more X-class flares each day through Tuesday, the SEC says. On Friday, a space radiation storm was captured in an image from the SOHO spacecraft, which monitors the Sun. The Sun is currently at a low point in its 11-year cycle of activity. While sunspots and flares are less common now, astronomers say they can pack plenty of punch when they do occur. A movie revealing some of the flare activity through Friday is available here. Another movie [Mpeg version / Large Quicktime Version] shows four moderate flares and two major flares from Friday, as seen by NASA's Transition Region and Coronal Explorer (TRACE) spacecraft. The images, taken in the extreme ultraviolet range, show radiation from plasma at 1 million to 2 million degrees. Loops extending out from the Sun are the result of plasma confined to travel along the coronal magnetic field which has emerged from below the photosphere, explained Jonathan Cirtain of the Harvard-Smithsonian Center for Astrophysics. SPACE.com's Leonard David contributed to this report.